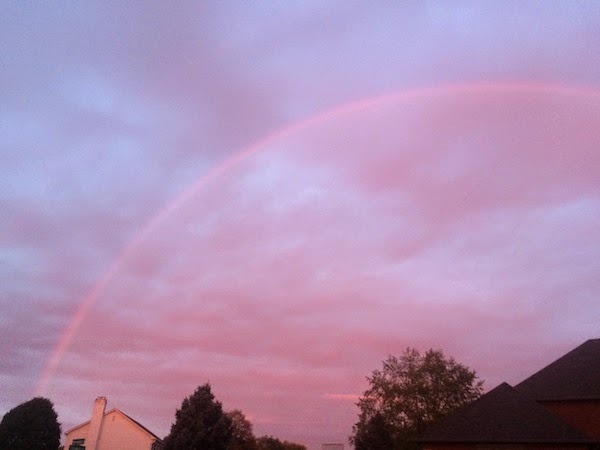 If a giant rainbow isn't the best way to start a new week, I don't know what is. God is the ultimate designer. We had a very chilly weekend, so it was a good excuse to do a little inside work. Ever since our spring break trip to Arizona, my 8 year old has been begging me to make the bedroom he shares with his 5 year old brother "more western." Well, I've been feeling guilty that I'd never answered his request. 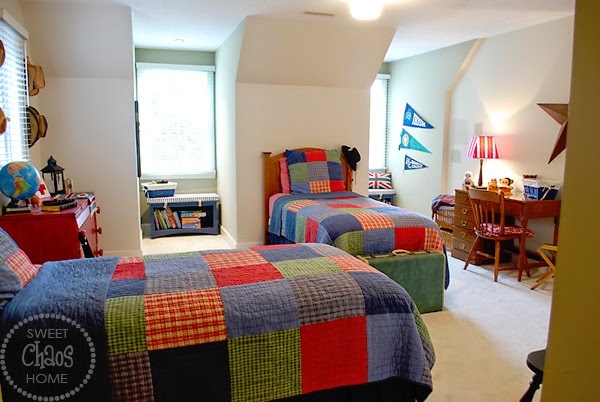 In fact, the bedroom remains much the same as it did when our older boys shared it. I'm not much of a "theme" room person, so I didn't want to go overboard. I also didn't want to spend much money. 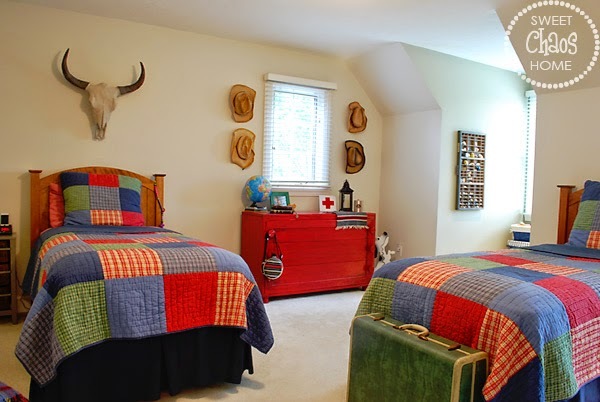 Using what we had on hand, and adding just a couple of small new items, I gave the room a western vibe. One new item I added was the faux cow skull from HomeGoods. I think that one piece alone would have taken care of the western vibe. The biggest change we made was removing the wall unit on one side of the room. Try as I did, that thing was one big clutter-collector. I kept only the desk, moved the dresser to the closet, and put the shelves in storage. Ahhh… much better! Losing all that furniture really opened up the room. I've had the star for years but wasn't using it anymore. I got the vintage camp stool on etsy. I bought a printer's tray at a vintage market eons ago, and finally hung it up. 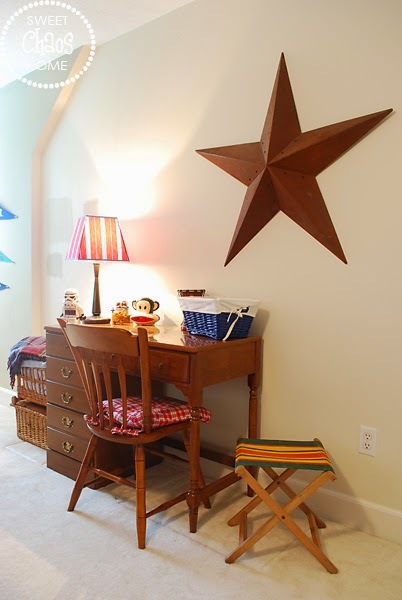 It is the perfect place for the kids to store their "treasures." 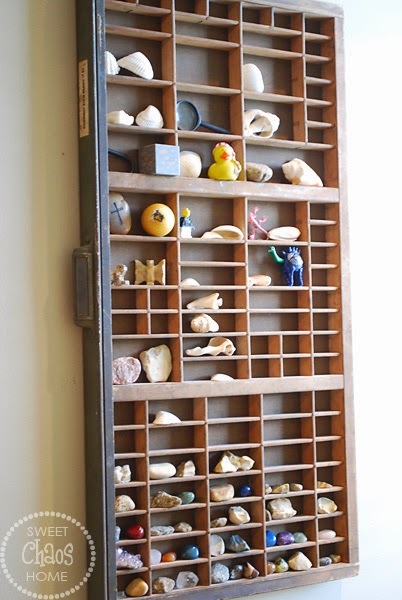 All the rock and shell collections that were junking up the room now have a place. 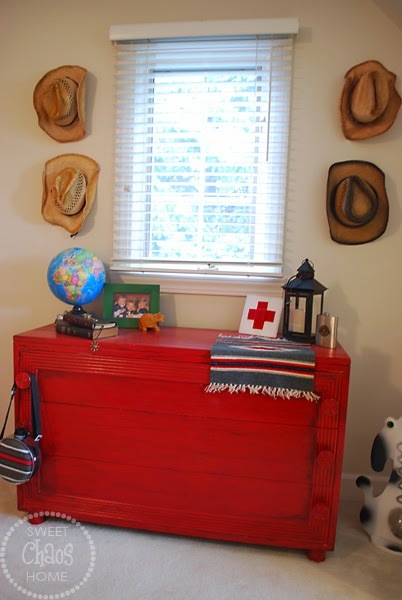 I restyled the dresser area by hanging hats and adding some other "western" things we already had like the lantern, rug and canteen. I picked up the little red cross sign at my friend, Lori's studio sale this weekend. You may have spotted a few paint samples on the wall. This room is going to get a fresh coat of paint soon. Well, hopefully by Christmas. 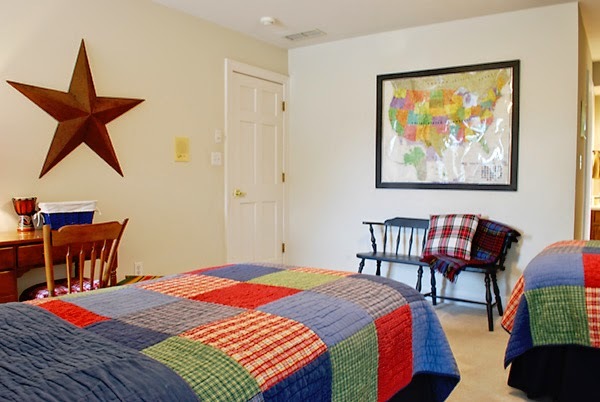 I had some big ideas for this room… like making window treatments out of drop cloths that looked like tent sides for the dormer walls and Pendleton blankets for a more rustic look. But, sometimes you've got to reign yourself in. Get it? 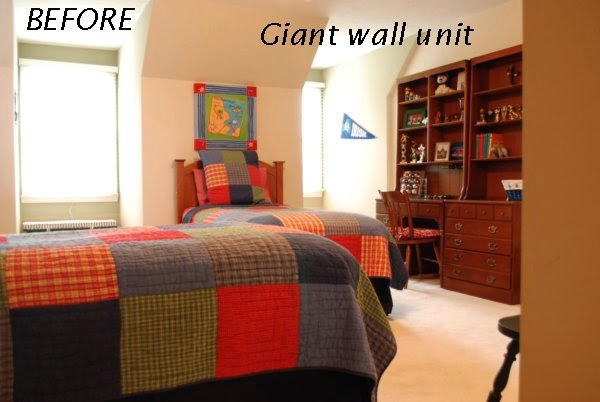 I had to remind myself it's a boys' room. They are happy as clams with the cow skull and cowboy hats. Anything more would have been me trying to get all fancy. And the wild west ain't for fancy folks. 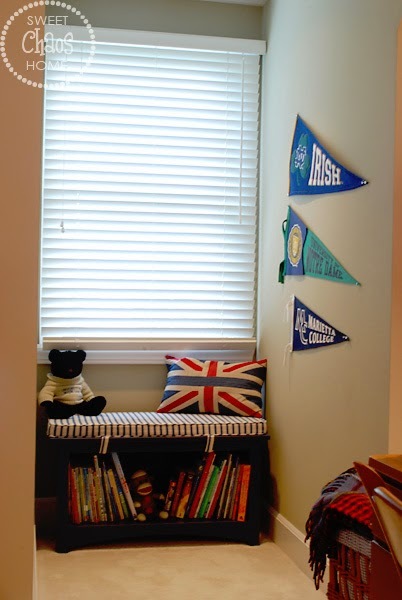 I know it's no rainbow, but the sight of a clean, organized kids' bedroom is also a rare sighting around these parts. It makes me rather giddy. 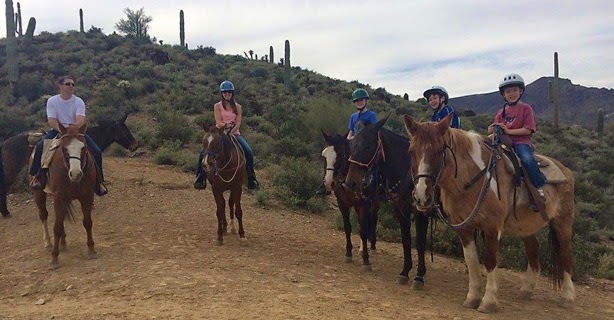 Giddy up and have a great week, friends!! love the updates! the hats are so awesome on the wall! LOVE IT ALL! especially the printers tray! i saw some at round top on friday and debated about getting one. now I'm kicking myself!!!! 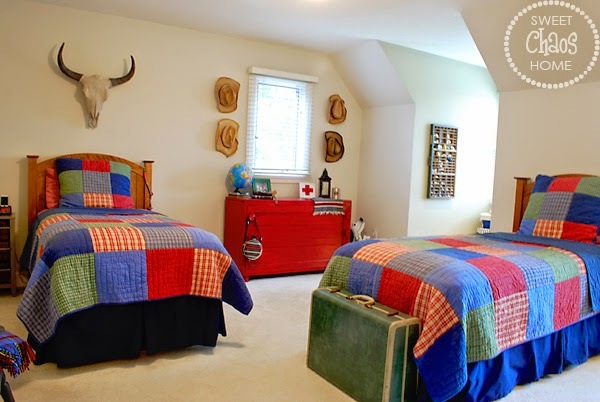 Came across your room makeover as I was searching for some cowboy/western themed rooms to show my readers as an example. 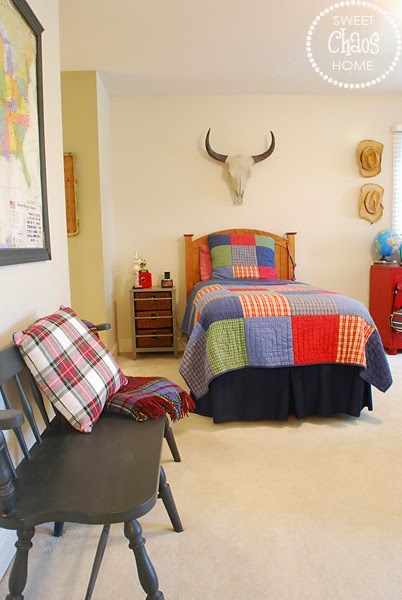 I have added a link to your page on my page http://www.thisdecormom.com/western-bedding-sets.html I hope you don't mind.